Tubeless percutaneous nephrolithotomy (PCNL) has proven to be an effective minimally invasive surgical technique for removing large kidney stones that cannot be removed utilizing more common or non-surgical treatments. This complex procedure is quickly becoming the preferred alternative to more invasive surgery or staged surgery (where multiple procedures are needed to clear a stone) for removing complex kidney stones in one step. Yet, only a small number of urologists nationwide are specially-trained to perform this advanced surgical procedure. Julio Davalos, M.D. is one of the few surgeons in the country performing tubeless PCNL, with more than 1,000 cases successfully completed. Since Dr. Davalos’ first tubeless PCNL surgery in a Chesapeake Urology ambulatory surgical center (ASC) in 2015, more than 300 tubeless PCNL surgeries have been completed in the specially equipped ASC. Dr. Davalos has also performed more than 2,000 traditional PCNL surgeries. Percutaneous nephrolithotomy or PCNL is used to remove kidney stones that are larger than 2cm in diameter and cannot be passed through the urinary tract. Percutaneous refers to surgery via a small incision through the skin, rather than an open, more invasive procedure. In some cases, patients may have a nephrostomy tube exiting the surgical site which is used to drain excess fluid from the kidney such as urine and blood. In tubeless PCNL, there is no tube. Rather, the tract leading from the outside of the body through to the kidney is sealed using a specially designed hemostatic plug developed by Julio Davalos, M.D., Director of the Advanced Kidney Stone program at Chesapeake Urology. Utilizing this tubeless approach, post-operative pain is minimized, patients experience no leakage of fluids through a nephrostomy tube, have a shorter hospital stay, and a quicker recovery and return to work and activities of daily living. 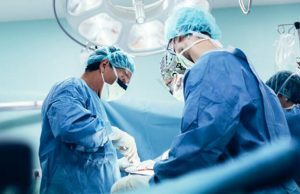 In addition, Dr. Davalos performs tubeless PCNL in a specially-equipped Chesapeake Urology ambulatory surgical center for appropriate patients, eliminating the need for hospitalization altogether. The entire team at this ASC are specially trained for tubeless PCNL surgeries. To learn more about tubeless PCNL, visit https://www.drjuliodavalos.com/.